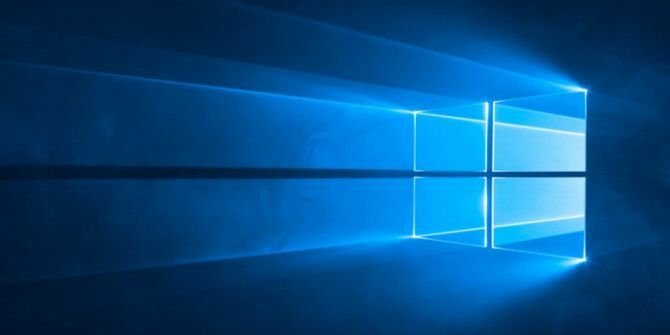 Since the Windows 10 Anniversary Update 9 Windows 10 Anniversary Update Features You'll Love 9 Windows 10 Anniversary Update Features You'll Love Are you still on the fence about the Windows 10 Anniversary Update? We have summarized the most important new features. Be sure to try all of them if you've already upgraded! Read More , the Windows Defender icon has found a permanent place in the notification area of the system tray. You might find this annoying, as many users do — and it isn’t so easy to hide. But there is a solution! The Windows Defender icon can be annoying because there is no option in its own settings to hide it in the notification area. A right-click on the icon just reveals the option to open the program. There is no option to close or disable the tool. As a functional icon, it doesn’t serve a purpose because you can easily launch it from the Start Menu or let it run automatically in the background. But you can remove the icon and clear the clutter. The simplest way is to drag the icon from the visible notification area to the little upward arrow that displays the hidden area with a few more icons. Of course, this isn’t really solving the problem — just sweeping it under the rug. But there is a more permanent solution. The Windows Defender icon in the notification area is triggered when Windows starts, so you can disable it with the help of Task Manager. Use the shortcut Ctrl + Alt + Esc to launch it or right-click on the taskbar and select Task Manager. Click the Startup tab. Scroll down the list of programs to find Windows Defender notification icon. You can click on the Name column and arrange it alphabetically. Right-click on entry and select Disable. Do You Keep It Running or Disabled? Windows Defender is the evolved face of Microsoft Security Essentials. It has now become the built-in antivirus solution for Windows 10 Windows Defender: 7 Things You Must Know About Microsoft's Antivirus Solution Windows Defender: 7 Things You Must Know About Microsoft's Antivirus Solution Is Microsoft's built-in security good enough? Microsoft continuously improves its security tools. We'll show you the upsides and downsides of Windows Defender in Windows 8, Read More . But it is one of the services on Windows 10 you can safely disable and swap with another better tool. But what are your thoughts on it? Do you find Windows Defender adequate? Do you take the pains to customize the icons in the Windows 10 system tray? Explore more about: Computer Security, Windows Defender. Windows Defender... Well, I'll be as polite as possible, considering I've seen the evolution of it. Yeah, the high-frequency of notifications was a problem I also faced. The Anniv Update didn't solve it too. Had to off the Enhanced Notifications as a first step.